Terma Simple ONE designer electric towel rails are a contemporary upgrade to conventional bathroom heaters, boasting a flat, cubed design that adds luxury appeal to bathrooms, washrooms, and en-suites. These versions of the Simple are finished in black, with a push-button interface for quick and convenient temperature management. Download or view the One heating element manual, Terma radiator manual, and Simple assembly instructions here. Download or view the Simple 500 x 1080mm technical drawing here. Download or view the Simple 500 x 1440mm technical drawing here. 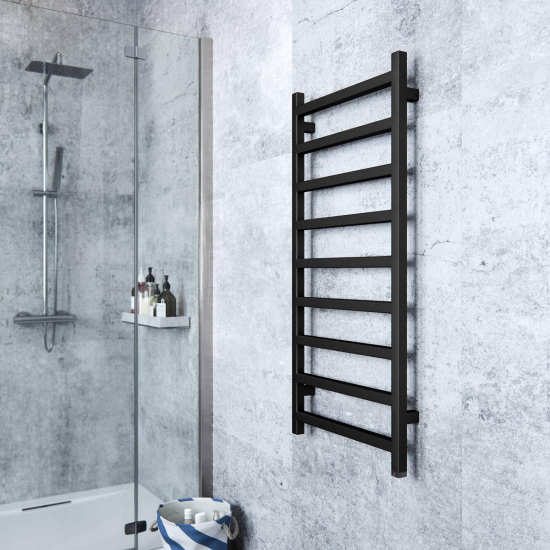 Terma Simple radiators are rated IPX5 and must be professionally installed by a qualified electrician in a suitable bathroom location. Always defer to the manufacturer’s guidelines about the bathroom suitability of any product. For further installation information, please see the Terma Simple mounting guide and product dimensions. The Terma Simple provides elegant bathroom heating with convenient, basic control. Its minimalist, geometric ladder design will look a treat in any modern bathroom looking for a clean and crisp aesthetic.